Taaaaaaaaadaaaaaaaaaaaaa - the random number generator has come up with #3 Are you curious about me? so I'll be emailing you for your snail mail addy. Congratulations! And hey, I haven't seen pictures of my followers for days - and now that I think about it haven't seen them on any blogs I've read either - is something going on with blogger that I don't know about??? Now that my work life six month project from you know where has slowed down, and my brain has VERY slowly returned so that I may actually have more than one brain cell left - I'm back to reading blogs and hopefully blogging myself. So let's get this party started with the first of four giveaways during August. 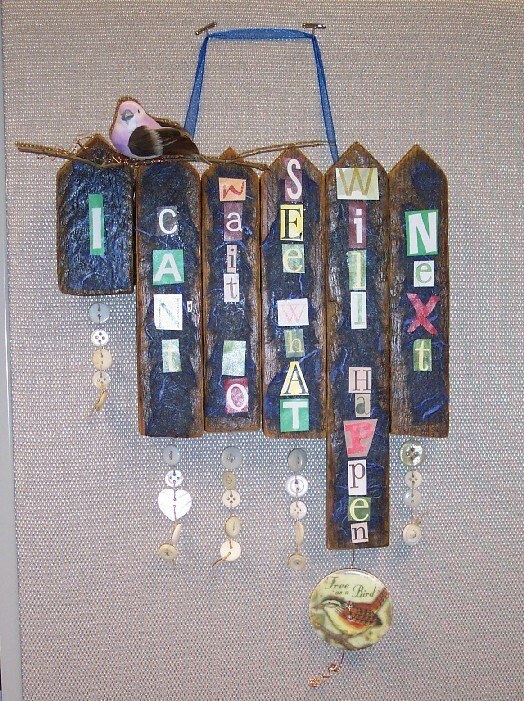 This is a little altered art goodie that says "I Can't Wait To See What Will Happen Next". Now I did have this little goodie hanging on the outside of my cubicle at work...but based on the last project have decided it's time to take it down and part with it. Why tempt fate, right? I still can't wait to see what will happen next - in my personal life and at home - but work is another matter LOLOLOL This is made from wood, paper, wire, buttons, and a little mushroom bird. I will draw from the comments (one per person please) on Saturday evening, August 13th. Good luck! That is EXACTLY what my co-workers would expect from me. And Lord, is this the time of year for me to have it. I've been working 12-14 hour days all week, and worked yesterday and today. This is definitely not my favorite thing to do. I have a life you know! So my favorite saying is "I so enjoy working here, cuz who knows what will happen next?" Not exactly what your signs says, but hey, I can certainly change my favorite saying!! Love it! Jill - so glad your life has slowed down and you can take a breath! Hope you have lots of time to do creative things! I'm having a givaway too. I love this piece it would work perfectly on the door of my new shed/studio. Please pop my name in YOUR hat and then pop over to my blog and pop your name in MY hat. Oh My dear Jill.........Have I told you how much I love you lately??? No, I haven't! I don't need any prizes,,,,and HOW did life get SO crazy that I've lost touch???? I've always LOVED your blog, or remote friendship,,,,,,,and your words about dealing with the aged on my post,were,,,,priceless! I think I relate, understand what you are going through too, and I appreciate your reply SO much! I don't need no "Stinkin" prizes......but still, I'd LOVE to have anything from you, because I KNOW that your schedule is SO busy and anything you make is from the heart! That, my dear, is the BESTEST! More than anything, know that I DO have the highest regards and respect for you! Okay,,,,,My Irish is showing....I'm being a bit poetic and rambling..........But I DO think the world of you! Hugs, Love and a "catch up" Bus on the Cheek!